Easily reduced to 30 speaking roles. See "Production Notes" in Script Sample. Backing Tracks CD with essential sound effects available. No pianist required! Vocal Tracks CD with essential sound effects available. However - for those of you who prefer a live pianoforte accompaniment, we now have available a superb BRAND NEW Performance Score which encompasses Overture, ALL Play Ons and Play Offs, Songs, Link Music, Cues and Chord Symbols. (Grade 5 / 6 standard). We also have available a BRAND NEW Rehearsal Score (Grade 4 standard). "I'm looking forward to doing this as my leavers play with my class and teachers Mr Nicholls and Mrs Moore . Thank you Eastfield "
"Hi, I really want to be Pierre! And best friend Abby is desperate to be Cedric! She has learnt all the lyrics to floatig zoo and we have only had our script for 2 days!! she's a great singer and I think she would make a great Cedric!! - Evie & Abby "
"Splash is a really nice play. My character is Joan and the experience is amazing. I learn alot." "splash was amazing I was mindy monkey and loved the dance routine I did"
"Splash was so much fun! I was Puke, but I got moved to be Shiela. We really enjoyed it . Songs were great, script so funny. We had a blast!" "One of our most successful productions to date. Lots of laughs, very colourful, lovely music. The number of speaking parts meant that each child's talents could be accommodated. So many compliments from the parents and other staff. Review by J Redman, St Mary's School, Gerrards Cross"
"I am doing this school play and it is so cool I love the song floating zoo and everybody monkey around!!! I am playing dribble a pie rat!!!" "I am doing this play at my school now and i love the song everybody monkey around i love it and i might do a dance for that song cause i am a dancer !!!!!!!!!!!!!!!!!!!!!!!!!!!!!!!!!!!!!!!!!!!!!!!!!!!!!!!!!" "The kids loved it.... The parents raved about it.... Splash was so easy to stage and costume. Everyone loved the music and it was so easy to direct!!!! I highly reccommend it. We are Craig Hawes fans over here!!! We need some new plays!" "Having bought the script last summer we tried out some of the songs at our junior workshops. The children loved singing them and the c/d was such a help with Magical songs all in just the right key for young voices. The script looked hilarious,so the decision was made for the juniors to perform SPLASH this summer. Last Saturday was the big day and what a success.Comments of "One of the best ever" and "so funny "from parents ( many who had a tear or two during the Rainbow number) We had great fun producing the show and the kids just loved becoming their comical characters. Well done Craig some wonderful songs and some great script. 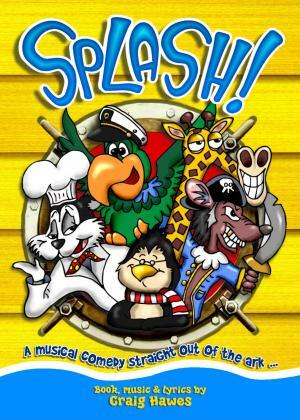 We shall be looking at more of your shows for future productions and have already highly recommended SPLASH to many others Keep em coming!" "A fantastic script. Characters were brilliant and music outstanding! Craig Hawes is a genius!!" "I loved the jokes! Very funny play - great songs." "I was Cedric Seagull and had a great time acting out the scenes. It is a very funny script and the first time i read it I thought that everyone would love it. We did it as our Year 6 play and it was one of the best events of my whole time at the school!!!" "I was Cedric Seagull and I had a great time and i know the rest of the cast, chorus and technical crew, did too!"